Reusable bags are tried and true marketing tools that are proven to effectively get your brand noticed. While we pride ourselves on offering reusable bags that can be customized however you’d like, we are also proud that our reusable bags are safe, lead-free, well made and available at low direct from the factory pricing. Learn how to put our quality and safety certified reusable bags to work for your brand. The vehicle you use to convey your branding message also makes a statement about your brand. Utilizing safe materials sends the message that your brand is aware, concerned and conscientious of your customer’s safety and well being. Our certified reusable bags comply with several safety protocols, including the Consumer Product Safety Improvement Act, California’s Proposition 65, the Consumer Product Safety Act (CPSA) and Toxics in Packaging Prevention Act (Tippa). What this means for your brand is that when you order custom reusable products from us, the products you receive are safe for your customers and the planet. Our factory also operates in an ethical and socially compliant manner. Our workers enjoy their fundamental rights, such as a safe environment and reasonable hours, as well as no child labor. These are traits that add to the value of your custom marketing tool. By creating customized reusable bags that are quality and safety certified, you can promote your brand without causing any negative impact of your customers, the planet or mankind as a whole. Quality construction means your customized reusable bags can be used again and again. This clearly benefits your brand, because each time it is used, it will get your marketing message out there and seen. The constant repetition will serve as a reminder of your brand and the services or products you offer not just to your customers, but also to everyone whose path they cross while carrying your branded bag. You also want your reusable bag to stand up to regular use, because the item is a representation of your brand. High-quality, certified reusable bags stand up to wear and tear and instill faith and confidence in your brand. When several styles of our bags were put up to various challenges and tests for capacity, mass per area, clean-ability and safety, they passed each test. To learn more about how our reusable bags preformed under a variety of safety and quality tests check out this report. 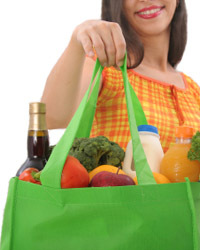 Ultimately, this means you can be confident your custom reusable shopping bags will hang in there whether they’re used to carry home a couple of odds and ends from work or the gym or a large holiday meal with all the fixings. We have a direct relationship with our factory. This means that when you place an order with us, we relay that info to our factory. There are no intermediaries who pass your order along to others intermediaries until eventually your order will arrive at a factory. Every time another middleman handles an order a markup is added. There is also an increased risk of errors being introduced to the order if it is being passed around. Given that we work directly with our factory, this means there are no additional mark ups or danger or miscommunication. Our direct relationship with our factory also gives us greater flexibility in terms of design. If you want to alter the design of any of our bags we can do that all at direct from the factory pricing. Our reusable bags are safe for the planet and your customers and great in terms of value and increasing your brand’s awareness. If you want a quote for a specific bag you can request a custom quote directly from any product page, or you can build your own bag and request a quote in our super simple 4-step process. Do you have questions about the process or pricing or anything else? Get in touch and we’ll help you out.